And so ends the reign of our Empress, long may she live. Asuka deserved every bit of the love and respect showed to her this week. In a time when NXT was not at its best, Kanako Urai soldiered on and carried not just the women’s division but the brand on her shoulders. She’s had great matches consistently, and her storyline was one of the best in NXT’s history. She’s one of the most important figures for the brand in the last two years, and she earned the pomp and circumstance. After 523 days as the face of the women’s division, the Empress had stepped down from her throne. My initial reaction the news that Asuka was choosing to relinquish the NXT Women’s Championship was hesitance. I figured it would’ve helped the division more if she actually put Ember Moon over in TakeOver: Brooklyn III. What a star making moment would it have been. They could've also brought up the whole collarbone injury story they ran post-TakeOver. That would’ve been a credible way to get the title off Asuka. But the more I thought about it, the more this decision to have her relinquish the title on her own accord rather than lose it made more sense. The whole Empress gimmick revolved around her dominance. As she is apt to scream, nobody is ready for Asuka, and to have her lose the title would have damaged the character more than put Moon over. She needed to stay undefeated, she needed to be on top, and even in her last moments in Full Sail, she needed to dictate the terms. The women’s division needed Asuka last year—she was the only legitimate star in the division after the WWE Draft drained the swamp—but it’s safe to say the Empress is leaving the division stronger than it was before. 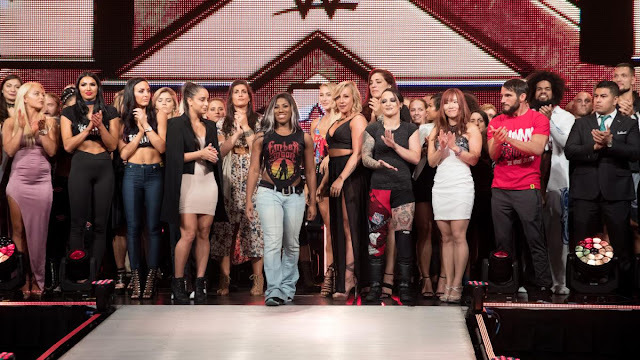 With established names like Moon, Ruby Riot, Nikki Cross, Peyton Royce, and Billie Kay, as well as up-and-coming talents from the Mae Young Classic and the Performance Center, the division is deeper than it’s ever been. There was no better ace for the women’s division than Asuka; she did great work at elevating not just herself, but everyone she worked with. The women’s division are standing on the shoulders of giants (like the Four Horsewomen), but nobody did more than for the division than Asuka. So what is next for the Empress? I want to see her on RAW. It’s clear the red brand has a lot more talented women they can pair up with Asuka. We’ve seen her work with Emma, Bayley, Nia Jax, and Alexa Bliss, and more often than not, she’s had good matches with those names. It’ll be a better fit for her—even if SmackDown Live needs her more. I can go on and wax poetic about the Empress, but the only thing we have left to say is thank you, Asuka. It’s been a hell of a reign. Andrade “Cien” Almas def. Cezar Bononi: I think Cien peaked a little too late. This is probably the best he’s been since arriving in NXT, but with the top of the card already cluttered by guys like NXT Champion Drew McIntyre, Roderick Strong, and Adam Cole, he’ll be stuck in midcard hell. NXT did well with Zelina Vega explaining her history with Almas by portraying the pairing as more platonic and professional, even if the sexual tension is there. There’s a lot more storytelling potential in teasing that than outrightly declaring that they’re a thing. Lars Sullivan def. Jake James, Alfred Watkins, & Ricky Martinez in a 3-on-1 Handicap Match: Hoss destroying people? Count me in. Sullivan’s one of the more intriguing prospects from the Performance Center, and I hope he turns out to be more like Braun Strowman rather than Baron Corbin. Feeding No Way Jose to Sullivan still stands as a great move, as Jose’s still surprisingly over and is not bad in the ring. Sonya Deville def. Zeda: Deville’s improved a lot, but it’s starting to become harder to keep my attention on her. Her MMA-inspired gimmick falls flat against MYC competitor Shayna Baszler. Deville’s already at a disadvantage when it comes to experience, so it’ll be a tough task for her to stay relevant once the MYC talents start flooding NXT. Kassius Ohno def. Hideo Itami in a No Disqualification match: The best word to describe this match and this feud would be underwhelming. They failed to capitalize on the No DQ stipulation in this match. Outside of a couple of chair spots and the finish, it feels like a regular match that failed to take off to the next level. I usually like good callbacks in matches, but the low blow finish felt like a cop-out and that was out of character for Ohno, who’s championed doing things the right way for most of this feud. Another chapter closes for NXT, and with it comes the end of Asuka’s reign. It’s probably the biggest thing you’ll remember from this episode, and for good reason. It feels like they tried to cram so much in one episode that it hurt every segment. Add the fact that for almost a whole day, the WWE Network had a broken copy of the episode streaming, and you’ll end up skipping a lot of things. Just for Asuka’s farewell segment, this episode gets a B+. 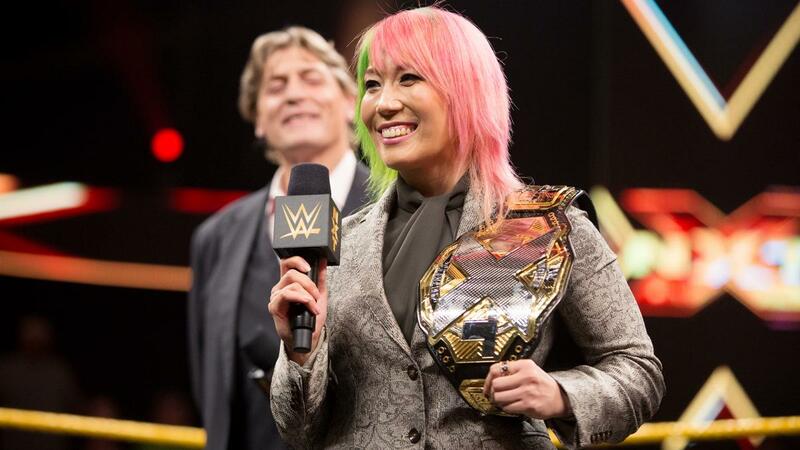 Thoughts on Asuka leaving NXT? Let us know by dropping a comment below!